Elena Has worked as an illustrator in Milan since 1984. 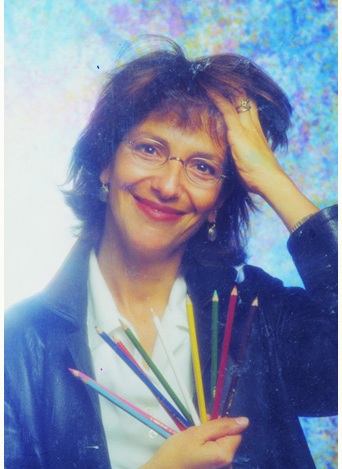 She started out painting backdrops for theatre productions and television programs (the italian production of “the Price is right”, “Sbirulina”, “Risatissima”, etc), worked with a number of advertising agencies (Armando Testa, Lintas, RSCG, DMB&B, Pirella&Gottsche to name a few) specializing in the childhood sector on accounts like Lines, Mellin and Chicco. She has freelanced for Italian magazines with nationwide distribution (Anna, Bella, Il Piacere, Il Diario, Confidenze, Dolli, Gente Viaggi, Famiglia Cristiana). For the Tanzanian Consulate she conceived, designed and painted calendars, postcards, textiles and organised events in Zanzibar and Dar se Salaam. Elena has been illustrating books for children and teens for the past ten years, designing for school texts and for various children’s magazines like Ciao Amici (il Messaggero Edizioni) and Pico (Gruner+Jahr /Mondadori Edizioni). With an Italian writer named Lodovica Cima she came up with the character Nero Porcello, a very popular figure which has allowed her to illustrate more than hundred books over the last ten years fore Ape Salani Publishers.